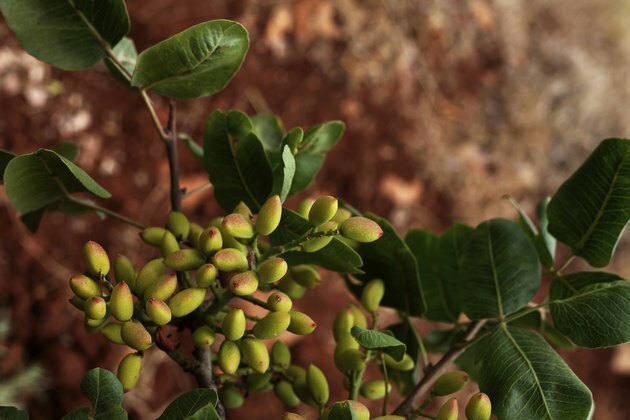 Pistachio trees (Pistacia vera) don't require much extra care beyond regular, ample watering and pruning, particularly during the first few years after you plant them. Pistachios thrive in U.S. Department of Agriculture plant hardiness zones 4 through 9, and tolerate drought conditions and temperatures in excess of 100 degrees Fahrenheit. If you plant your pistachios in deep, well-draining soil with a pH between 7.0 and 8.0, you can expect substantial harvests to begin about 10 years after planting. Don't let the pistachio fruits touch the soil during harvest or they can contract a fungal disease. Irrigate each pistachio tree with about 10 gallons of water for every 1 inch of trunk width every two weeks; keep the trunk dry when watering. Maintain 4 feet of moisture penetration in the soil under the canopy throughout the growing season. If your area experiences an extended dry period, increase the watering frequency to once a week. Trim the main shoots back to their first lateral shoots during dormancy. Leave the lateral shoots intact. Wipe the blades of your pruning tools with rubbing alcohol before you begin and between cuts. Cut back crossed, damaged and diseased branches during dormancy. When pruning mature pistachio trees, leave a few of the vegetative buds that grow past the fruit buds intact. Fruit buds and vegetative buds have a similar appearance, but you can differentiate them by size -- fruit buds are larger than vegetative buds. Check the pistachio branches for soft scale insects during dormancy. Treat soft scale insects, which resemble tiny gray-white bumps about the size of a pencil tip, by spraying 2 percent dormant oil on the branches. Spray enough to cover the entire plant, including the undersides of leaves. Start spring cleaning as soon as the ground warms to about 65 degrees F. Pull weeds and remove debris from around the pistachio trees, and trim off any branches that show signs of disease. Wipe the pruners with alcohol before you star and between cuts so you won't spread anything, and destroy any affected trimmings or dispose of them in a sealed plastic garbage bag. Spray pistachio trees in their first year of growth every three weeks with a multi-nutrient trace element spray containing copper, boron and zinc. Spray mature pistachio tree with a zinc foliar spray each year right before the first frost in fall and right after the last frost of the season in spring. Fertilize each pistachio tree with 20 to 25 pounds of manure when the ground warms up to 65 degrees F in spring. Follow fertilization with watering to a depth of 4 feet. Harvest pistachios in fall. Cover the ground under the canopy with a tarp or dropcloth to prevent the pistachios from coming in contact with the soil -- ripe pistachios fall from the branches when you agitate the tree. Look for stinkbugs and leaf-footed plant bugs on the trees throughout the growing season. Leaf-footed plant bugs measure about 3/4 inch long and have yellow-brown bodies with a yellow band on their back; stinkbugs are shaped like a shield and range in color from grayish brown to green with yellow to green legs. Spray pistachio trees affected by stinkbugs or leaf-footed plant bugs with an organic pesticide, such as one containing 1 percent insecticidal soap, 0.9 percent neem oil and 0.012 percent pyrethrine at the first sign of an infestation. Examine the pistachio trees for alternaria late blight and septoria leaf spot during the growing season if you live in a humid area or have extended periods of heavy rainfall. Spray all the surfaces of the pistachio trees with Bordeaux mixture when the ground temperature reaches 65 degrees F and just before the first forecasted frost of the season in fall. Why Do My Arborvitae Turn Brown? What Should Peach Trees Be Sprayed With to Prevent Insects?